Coin Controls C120 Electronic Coin Mechanisms will recognise and validate up to 12 different coins and/or tokens. Latest validator technology ensures high control over acceptance of programmed coin types and rejection of fakes. 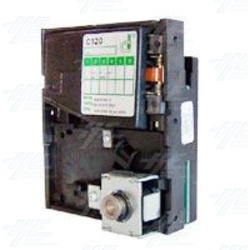 The C120 coin mechanism can be used for new or retrofit applications in the Arcade, Pinball, Gaming and Vending areas. Coin Accept / Reject Routing: The CC C120 coin mechanism has two operating paths for the acceptance or rejection of a coin or token. Top Load / Bottom Reject : the coin/token is input via the slot located on the top of the coin mechanism chassis. As it passes the validating sensors it is routed (depending on the "data sensed" compared to the stored "data parameters" in the PCB EEPROM)either to the accept or reject chutes, both of which are located on the bottom of the coin mechanism chassis. Top Load / Front Reject : the coin/token is input via the slot located on top of the coin mechanism chassis. As it passes the validating sensors it is routed (depending on the "data sensed" compared to the stored "data parameters" in the PCB EEPROM) either to the accept chute located on the bottom of the coin mechanism chassis or, if rejected, it will exit via the slot located on the front bottom of the coin mechanism. Various standard face-plates are available for use with either of the configurations as described above. Adaptability: Due to its standard dimensions the CC C120 Electronic coin mechanisms is interchangeable with other coin mechanisms such as the NRI G13 and G18 series, Fage validators, RM5 Evolution series, Money Controls S10 / S7 series. The ability to re-programme the C120 coin mechanisms easily using "coin-set" files representing different "channel output mapping" configurations allows for easy retrofitting into Host machines. Voltage: The Voltage range of the C120 is typically 12vDC but will function from 11vDC - 24vDC (=/-10%) It is necessary to ensure that voltage is maintained above 11vDC as low voltage will cause coin mechanism malfunction. Coins may or may not be accepted accurately. Dip-switches: Up to 12 different tokens and/or coins can be programmed into two banks of channels: 1 - 6 and 7 - 12. The banks are easy to select by utilising the 4-way dip-switch settings located on the coin mechanism's PCB. Bank 1 : Switch 1 = On Switch 2 = Off Bank 2 : Switch 1 = Off Switch 2 = On All 12 channels (1 - 6, 7 - 12), can be inhibited by utilising the 6-way dip-switch settings on the PCB. Block Channel 1 & 7 = Dip-switch 1 On Block Channel 2 & 8 = Dip-switch 2 On Block Channel 3 & 9 = Dip-switch 3 On Block Channel 4 & 10 = Dip-switch 4 On Block Channel 5 & 11 = Dip-switch 5 On Block Channel 6 & 12 = Dip-switch 6 On Coin to Channel Programming: Using the Mektek PC and Hand-held Programmer based software application and adapter panel, the C120 coin mechanism (and others), can be programmed for different coin types and channel output mapping, making it easily adaptable world-wide. Pre-programmed "coin-set" files allow for channel output mapping (which channel outputs to which parallel interface pin), and coin recognition values to be easily uploaded to the EEPROM. When the desired coin-set file has been selected, an easy and simple "coin-training" routine is run by the PC software to enable "coin to channel" recognition in the coin mechanisms memory. Once the necessary coin types have been programmed through the coin mechanism all the collected coin and channel data is uploaded to the EEPROM. A simple validator test then ensures correct coin to channel recognition. Coin to Channel Cloning: When a coin mechanism is known to have the desired parameters required for other similar coin mechanisms, to save time a simple "Cloning" process (which copies exactly the host coin mechanisms EEPROM data) is performed and this data is stored as a file on your PC. When programming a new coin mechanism, the file is uploaded to the EEPROM directly (no coin training required). Once the EEPROM has accepted the new parameters, simply insert required coins for testing. Coin Controls C120 Electronic Coin Mechanisms will recognise and validate up to 12 different coins and/or tokens. Latest validator technology ensures high control over acceptance of programmed coin types and rejection of fakes. The C120 coin mechanism can be used for new or retrofit applications in the Arcade, Pinball, Gaming and Vending areas. The CC C120 coin mechanism has two operating paths for the acceptance or rejection of a coin or token. Top Load / Bottom Reject : the coin/token is input via the slot located on the top of the coin mechanism chassis. As it passes the validating sensors it is routed (depending on the "data sensed" compared to the stored "data parameters" in the PCB EEPROM)either to the accept or reject chutes, both of which are located on the bottom of the coin mechanism chassis. Top Load / Front Reject : the coin/token is input via the slot located on top of the coin mechanism chassis. As it passes the validating sensors it is routed (depending on the "data sensed" compared to the stored "data parameters" in the PCB EEPROM) either to the accept chute located on the bottom of the coin mechanism chassis or, if rejected, it will exit via the slot located on the front bottom of the coin mechanism. Various standard face-plates are available for use with either of the configurations as described above. Due to its standard dimensions the CC C120 Electronic coin mechanisms is interchangeable with other coin mechanisms such as the NRI G13 and G18 series, Fage validators, RM5 Evolution series, Money Controls S10 / S7 series. The ability to re-programme the C120 coin mechanisms easily using "coin-set" files representing different "channel output mapping" configurations allows for easy retrofitting into Host machines. It is necessary to ensure that voltage is maintained above 11vDC as low voltage will cause coin mechanism malfunction. Coins may or may not be accepted accurately. Up to 12 different tokens and/or coins can be programmed into two banks of channels: 1 - 6 and 7 - 12. The banks are easy to select by utilising the 4-way dip-switch settings located on the coin mechanism's PCB. All 12 channels (1 - 6, 7 - 12), can be inhibited by utilising the 6-way dip-switch settings on the PCB. Using the Mektek PC and Hand-held Programmer based software application and adapter panel, the C120 coin mechanism (and others), can be programmed for different coin types and channel output mapping, making it easily adaptable world-wide. Pre-programmed "coin-set" files allow for channel output mapping (which channel outputs to which parallel interface pin), and coin recognition values to be easily uploaded to the EEPROM. When the desired coin-set file has been selected, an easy and simple "coin-training" routine is run by the PC software to enable "coin to channel" recognition in the coin mechanisms memory. coin mechanism all the collected coin and channel data is uploaded to the EEPROM. A simple validator test then ensures correct coin to channel recognition. When a coin mechanism is known to have the desired parameters required for other similar coin mechanisms, to save time a simple "Cloning" process (which copies exactly the host coin mechanisms EEPROM data) is performed and this data is stored as a file on your PC. When programming a new coin mechanism, the file is uploaded to the EEPROM directly (no coin training required). Once the EEPROM has accepted the new parameters, simply insert required coins for testing. 10 way ribbon cable with polarised female IDC connector.